After running 10K (and dying afterwards) during Nike's We Run Manila 2012, I promised myself to get in shape first before joining any other race. But then, I found out about Asian Food Channel's Eat & Run, which isn't like any other run I've heard of. How does it work? Well, you run then you eat. Obviously, they had me at "you eat". So I'm making an exception next Sunday, March 24. Form a team with 3 members (Runner A, Runner B & Runner C). Runner A runs 2K until he/she reaches a food station. Runner A drinks CarbTrim and eats the meal prepared for him/her at the station. After finishing his/her food, Runner A passes the food bib to Runner B.
Runner B will do the same thing Runner A did. Then it's Runner C's turn to do all of that as well. After Runner C finishes his/her meal, all three runners will skip/hop/walk/run/dash to the finish line. So, each runner will run 2K and each runner will eat a meal at the end of each leg. Sounds fun right? Deadline for registration is on March 23 or until all slots are filled up, whichever comes first. P500 per head or P1,500 per team. 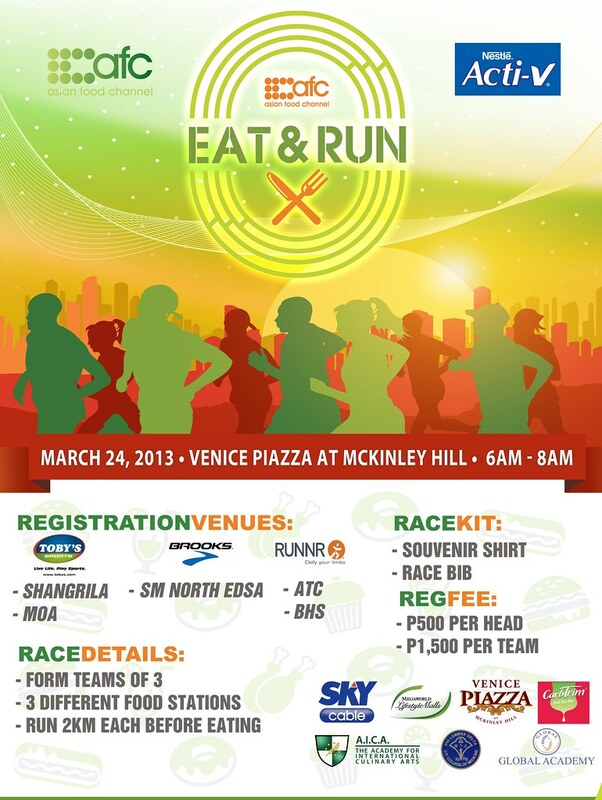 In return, participants will get a race pack that includes an Eat & Run shirt, waterproof race bib and food bib. What prizes will be given away? And a "Best in Costume" award! Yes! Participants are encouraged to wear costumes and accessories but make sure you can still run in them. Where can I get more details about the event? For more information, visit the Asian Food Channel's Eat & Run Facebook page. Remember, the goal of this run is to have fun! So hope to see you guys there! That sounds like so much fun! At least you have an incentive for running!